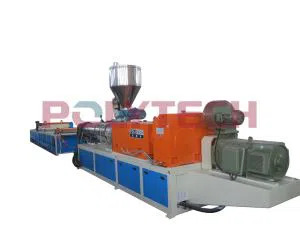 1, Two or three conical screw extruders, such as 65/132,80/156.92/188, has different layers and capacity for roofing tile sheet. 2, ASA/PMMA co extrusion layer, made from 50/30 single screw extruder or 65/30 extruder. 3, T die extrusion mould to make flat wilder sheet, very important part to keep good surface. 4, One or two cooling shaping mould sets, keep good shaping and cooling for pvc wave roof sheet. 5, Special rubber roller Haul-off machine, ensure stable production without much volatility. 6, Blade Cutter with pneumatic system without any dust. 8, Pay off device for firberglass. Fiberglass Reinforced UPVC roof sheet machine is a modern rigid four layer Un-plasticized poly vinyl chloride roofing sheets. The advanced technology of manufacturing ensures superior quality and performance of the roofing product. This Fiberglass Reinforced UPVC roof sheet is the best replacement to conventional asbestos, metal G.I. sheets, fiberglass sheets, ceramic tile sheets and UPVC sheets considering the heat insulation, sound insulation, water resistance, chemical and alkali resistance, corrosion proof, fire retardant, eco-friendly, easy to install and move, light weight as well as cost effective in installation and it can save construction cost up to 70%. As per the efficiency and benefits it provides. Clapboard of the road and etc.